This summer, East Bay Community Energy (EBCE), Alameda County’s new Community Choice energy program, continued progress towards providing electricity to residents and businesses in the spring of 2018. Most relevant for community-minded advocates, the major activities since May have been the seating of a Community Advisory Committee, drafting of an Implementation Plan, progress on the local development business plan, and hiring of a CEO. 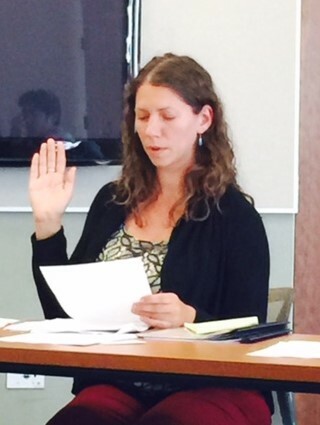 At the first meeting on July 6, the committee selected Anne Olivia Eldred as Chair and Nick Gigliotti as Vice Chair. Anne Olivia was instrumental in developing the groundbreaking unity proposal by the Alameda Labor Council and the community-based East Bay Clean Power Alliance in October 2016 to ensure the founding document of EBCE prioritized community benefits and community engagement. All meetings of the Community Advisory Committee are open to the public, details available here. Implementation Plan & Automatic enrollment in 100% Renewable Option. Since June, both the EBCE Board and the Community Advisory Committee have primarily discussed the Implementation Plan. A requirement of the California Public Utilities Commission, the Plan provides information regarding the process and plans for a new Community Choice energy program. The Implementation Plan has raised some contentious issues. These include the pace at which customers are enrolled, how net revenues will be used, and the question of whether cities can automatically enroll their electricity customers in a 100% renewable energy option that is more expensive than their current electricity bills. The East Bay Clean Power Alliance strongly opposes such an option, as it discriminates against lower income ratepayers who struggle to pay their electricity bills and undermines the anticipated benefits of the Community Choice program. While a premium priced option should be made available and encouraged for those that can afford it, it should not be imposed on those who cannot. Community Choice is meant to provide economic benefits, not create financial hardship. The EBCE Board decided not to address this issue in the Implementation Plan, leaving the debate and ultimate vote to a later date. Progress on local development business plan. EBCE is working on a local development business plan as a high level roadmap of how the program could achieve many community benefits by building out local renewable energy resources. The team selected to create the business plan held a series of focus groups in June to get public input on different aspects of the plan. Members of the East Bay Clean Power Alliance and other community advocates participated. CEO selected. In June, the EBCE governing board selected Nicolas Chaset as CEO of EBCE. Mr. Chaset has served as Chief of Staff of California Public Utilities President, Michael Picker, since 2014. For more information, contact Jessica Tovar, Coordinator, East Bay Clean Power Alliance, at jessica@localcleanenergy.org.